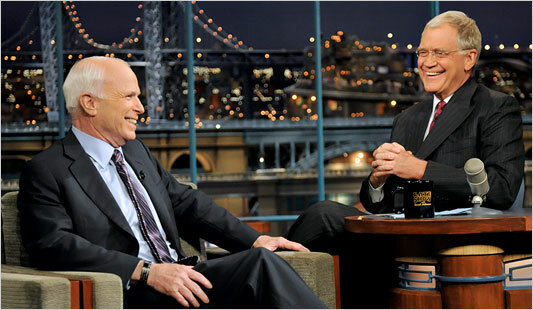 After standing up David Letterman on September 24, John McCain showed up for his appearance tonight on The Late Show with David Letterman. Just in case, Dave had Keith Olbermann on stand by. Then Mr. McCain jokingly said that he asked his son in the Marine Corps to FedEx his flak jacket in preparation for the visit. Dave went on to note John McCain’s association with G. Gordon Liddy. In a related story, Fox is running a report complaining that the late night comics are skewering the Republicans seven times as often as the Democrats. There is something bizarre in seeing this at Fox’s site, considering how biased and one-sided Fox is with regards to what they claim to be news. News reports, as opposed to the partisan propaganda which comes for Fox, is expected to be “fair and balanced” in fact as opposed to in slogan only. Late night comics are not bound to the same standards of balance as a news organization. Besides, there is good reason why the comics make fun of the Republican candidates far more often. This post gives two good examples above: John McCain claims that Sarah Palin is qualified to be president when she clearly is not and John McCain continues to repeat the same lies about Ayers when the claims have been thoroughly debunked. The campaign being run by the Republicans is a total joke which is out of touch with reality. McCain and Palin repeatedly say the most absurd and dishonest things and totally ignore all evidence that what they say is untrue. There is simply far more material to mock in the Republican campaign than there is in the Democratic campaign. Posted in Barack Obama, Humor and Satire, John McCain, News Media, Sarah Palin, Television. Tags: 9/11, Barack Obama, David Letterman, Democrats, Fox, John McCain, Keith Olbermann, Republicans, Sarah Palin. RSS feed for comments on this post.. TrackBack URL. A replacement video has been added which works, at least at the present. If the take this down, there is now full video available at the show’s official site. Letterman at his very best!!! Especially in the 2nd half of the McCain interview! Good to see that both -at least somewhat- kept their sense of humor in all of this though.